I recently wrote about the largest high-redshift cosmological simulation of galaxy formation ever, which has been recently completed by a group of astrophysicists in the U.S. and the U.K. This tour-de-force simulation, named BlueTides, was performed on the Blue Waters Cray XE supercomputer at NCSA and employed 648,000 cores. The researchers utilized approximately 700 billion particles (!) to represent dark matter and ordinary matter and to create galaxies inside the supercomputer. You can find the full article describing the simulation at insidehpc.com. Galaxies are the fundamental building blocks of the large scale structure of the universe. Very early on, before the first galaxies formed, the universe was a highly uniform mix of dark matter and ordinary matter, but with about 5 times as much dark matter by mass relative to the ordinary matter (protons, neutrons, electrons) that makes up the visible parts of galaxies, including stars, gas and dust. Ares of higher dark matter density play a key role in gravitationally attracting ordinary matter that forms galaxies and stars. When we think of the word galaxy we typically think of beautiful modern day spiral galaxies, such as the Andromeda Galaxy. Spiral galaxies are flattened, rotating disks; the spiral arms represent concentrations of matter and of star-forming regions. The most distant disk-shaped galaxies that have been detected are at redshifts of 2 to 3, so we are seeing them as they were when the universe was around 2 to 3 billion years old. (The higher the redshift the more distant the galaxy and also the farther back in time we are looking, toward the universe’s origin some 13.8 billion years ago). The BlueTides simulation provides insight into what was going on when the universe was only around 1/2 a billion years old, with galaxy redshifts around 8 to 10. It does a good job of matching the limited observational data we have at such highredshifts, in particular the rest frame (before redshift) ultraviolet luminosities of the earliest detected galaxies from the Hubble Space Telescope surveys. Their simulation finds that, among the most massive galaxies in their simulation, “a significant fraction are visually disk-like, and surprisingly regular in shape”. 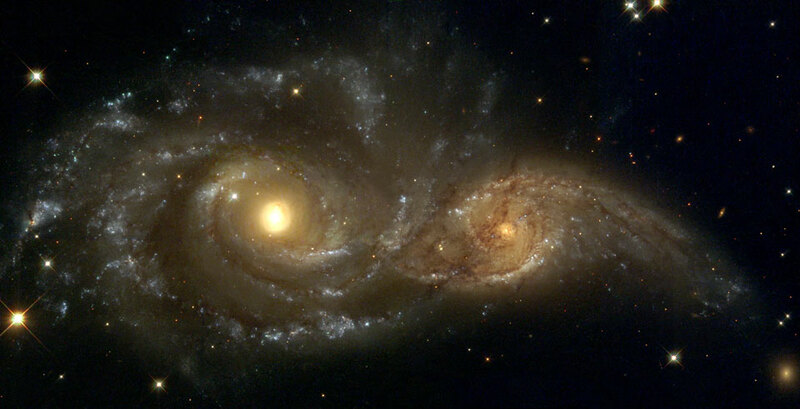 In other words, they appear to be the progenitors of present-day spiral galaxies. They find that, at a redshift of 8, a full 70% of their virtual galaxies with masses above 10 billion solar masses are classifiable as disks, since a majority of stellar orbits lie in the plane of the disk. 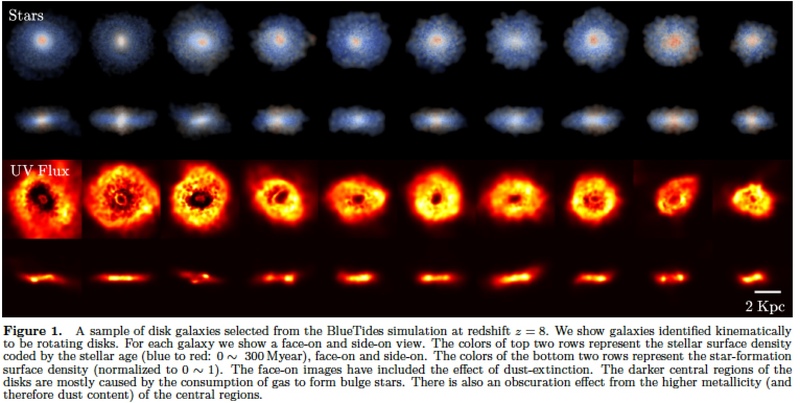 Simulated high-redshift galaxies from BlueTides – Figure 1 from Feng et al. They also find that mergers are not of major significance in the build-up of these early massive galaxies. Rather it appears that they grew primarily by cold gas arriving from preferred directions, namely along filaments in the density distribution of the background gas. It is well known that the universe has a web-like or filamentary structure of high density regions interspersed with voids (relatively empty regions). This filamentary structure is believed on the basis of many simulations of the large-scale universe to have begun at an early date. A future infrared satellite known as WFIRST will have a field of view 200 times larger than the Wide Field Camera on the Hubble. Also, its design for infrared radiation detection makes it appropriate for studying the light from high-redshift galaxies. The authors predict that a survey of 2000 square degrees with WFIRST should find roughly 8000 massive disk-type galaxies at redshifts above 8. Future very large ground-based telescopes will be able to make follow-up observations of galaxies discovered by WFIRST. Such observations will provide further insight into the nature of galaxy formation, including accretion of material from the background and the details of dark matter’s role in the process. This entry was posted on Sunday, May 10th, 2015 at 11:31 am	and tagged with Andromeda galaxy, Dark matter, early universe, first galaxies, Hubble Space Telescope, Milky Way galaxy, spiral galaxies, WFIRST and posted in Dark Matter. You can follow any responses to this entry through the RSS 2.0 feed.